Happy Thursday! 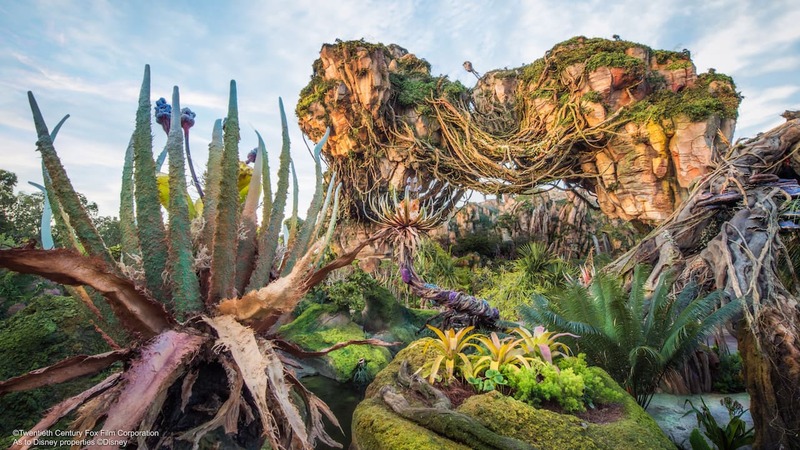 We’re happy to have a new look inside a New Fantasyland attraction – Pete’s Silly Sideshow – to share with you today. 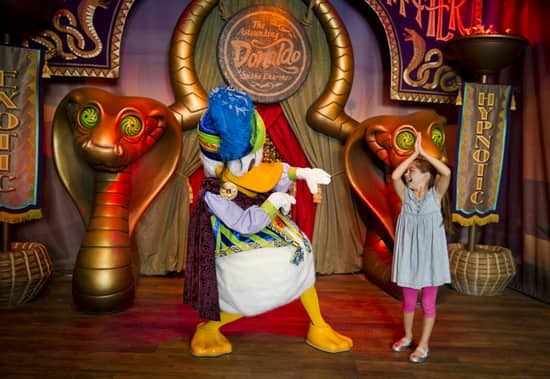 At Pete’s Silly Sideshow, the custom-designed character greeting location created exclusively for Storybook Circus, you are invited to choose a path to meet either Donald Duck and Goofy or Minnie Mouse and Daisy, each playing their own unique role at the circus. Donald is The Astounding Donaldo, the most charming of snake charmers. Goofy, of course, is The Great Goofini, circus stuntman extraordinaire. Daisy Duck plays the part of Madame Daisy Fortuna, a mysterious gypsy fortuneteller, and Minnie Mouse is the “Siren of the Seine,” that Parisian poodle trainer Minnie Magnifique. Detailed props and settings help reinforce each of their stories and fully immerse you in the world of the circus sideshow. What do you think? Will you visit soon? We got to meet the Pete’s Silly Sideshow characters last week. The whole area is adorable! The Great Goofini was particularly playful and fun. Minnie’s dress was really pretty and Donald and Daisy were cute too. The Storybook Circus area theming makes old Fantasyland seem dated – it is so well done. Can’t wait for more to open! Will there be a Passholder Preview opportunity? Will there be a SOTMK card for this opening? I am curious too–Is Pete’s Silly Sideshow character greeting location already open??? Will this affect where characters are located for meet and greets at upcoming Mickey’s Not So Scary Halloween Partys this year??? Will Minnie no longer be with Mickey in Town Square at the Halloween Party? Thanks. The easiest way to find character info for the night you’ll be visiting is to pick up a Times Guide and a special Not-So-Scary map. That will give you times/locations for characters you’re looking for. Will these meet and greets be doing fast pass like the Mickey on Main Street? Come on December, can’t wait too see this in person! We will be arriving tomorrow and I am wondering if Pete’s sideshow is already open to meet these characters? Will we be able to meet these great characters next week????? I am so hoping! Please let us know! When will the Enchanted Forest be completed? How much of the Enchanted Forest will be done by June 8,2013(my daughter’s 13th birthday)? Same one from post 1. That looks like so much fun! I love that you’re adding new and exciting features to the Park. Wondering the same as poster 2. Will it be opening soon, or w/ the rest of the expansion? They need to do a meet and greet with Dumbo. That would be awsome. I know they have had a Dumbo character in the past. Will these characters greetings have interactive elements to them? And if you go into one greeting area and want to visit another (say meet both Minnie and Daisy), will you have to wait in two lines or are any of the greetings linked to each other? You choose a line for Minnie & Daisy OR Donald & Goofy. Does this mean no more Minnie meeting with Mickey at Town Square Theater or will she still be meeting there during certain times of the day? Will it be opening soon or will it be open with the rest of Fantasyland? Hoping it’s sooner so that my dad can visit the Great Goofini when we arrive on November 3rd! Pieces of Storybook Circus has already opened…the “official” opening date is Dec. 6. My daughter is all excited about the new Fantasyland. Especially the Enchanted Forest. For her 13th birthday,she wants to go see it. She’ll be turning 13 in June 2013.